Hemingwayapp is a nifty little web tool that I just found out about from the amazing educator, Ozge Karaoglu. This is a nice site for students who want to improve their Writing skills. 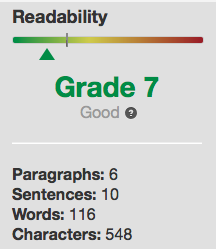 All a user has to do is copy/paste in some text and click edit and they will get a Readability score. The score will tell you how many paragraphs/words you have, how many hard to read sentences, suggestions on how to shorten or switch verbs around, etc etc. I highly recommend checking out Hemingwayapp by clicking here!! !